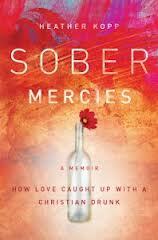 a book chick: "Sober Mercies"
my take: This memoir is written by a woman who at first glance might seem impervious to alcoholism ... a tea-totaling born-again Christian with a successful career in Christian publishing ... so it was fascinating to learn of her path to addiction and recovery. And how she could consume massive amounts of alcohol without anyone knowing. Yes! I know! I've keep posting about addiction. These books have come my way and I feel compelled to read them in the off chance that I'll be able to better relate to/understand/encourage the ladies I work with in recovery. The ladies tell me it's inspiring for them to read someone else's journey. my source: I won this book through www.momastery.com ... sweet! I commented on the blog saying if I won it i would donate it to Harbor House for my ladies in recovery... so it's there and I can't loan it to you.